Often one of the most important accessories for our homes is also the most complicated and aesthetically unsightly: gargantuan black monoliths that can easily become a tasteless eyesore in the middle of a well-designed and thoughtful space. Televisions are not much to look at, but like it or not, they're often the central point of our domestic living spaces. We huddle around them, gather nearby to them, and generally require a TV somewhere in our home. 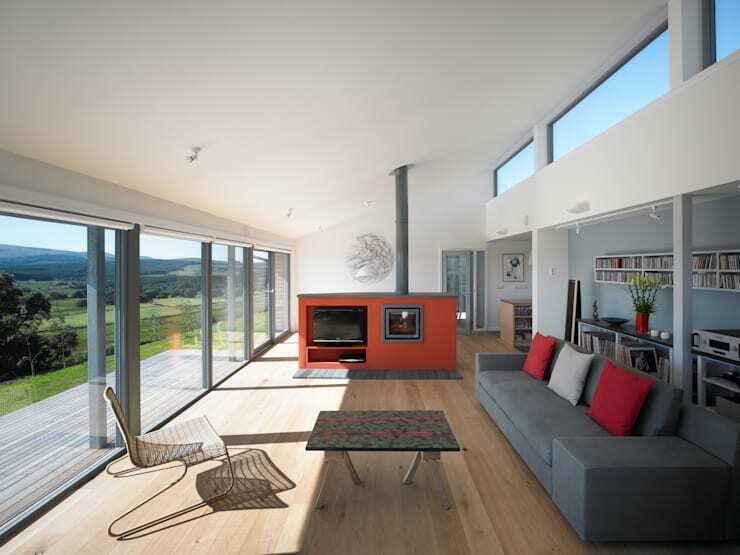 So how can you ensure your home is stylishly decorated while still incorporating a television into the space? For some handy tips, and helpful advice, take a look at the following examples below, and ensure you decorate your home around your television in a subtle and stylish way. This room makes a statement with its television. Instead of hiding it away, the flat screen is placed proudly at optimum level within the living space for viewing. This minimal partition works wonderfully to segregate the kitchen from the lounge, and offers a sleek design to keep one’s TV in an area that, although central and accessible, is surprisingly unimposing on the space. This warehouse conversion offers a wonderful space that would work brilliantly when entertaining, but also offers the flexibility of an intimate and cosy space for relaxing with friends and family. Perhaps you have a television that you sometimes use but are unwilling to make a feature of the space? 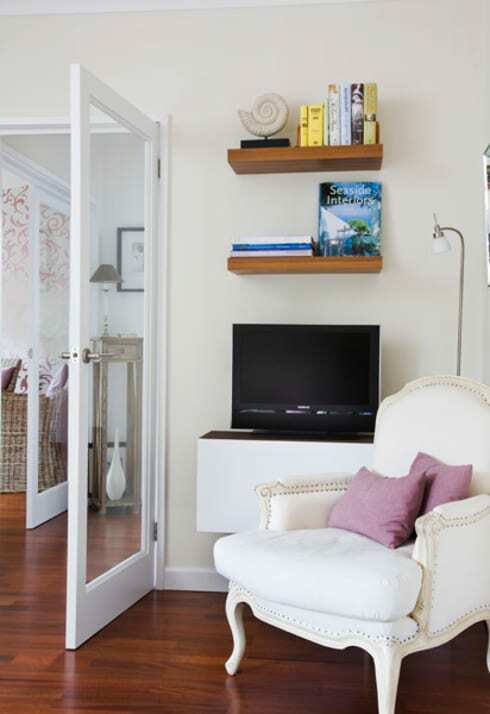 Check out this stylish corner system which utilises a hanging cupboard upon which the television can sit. Above this corner unit are two shelves which hold books and other ornaments, and work wonderfully in keeping the space clean and stylish. This is a great solution for a family or living space that does not use its television very often, but simply wants the convenience of one should they wish to watch something. 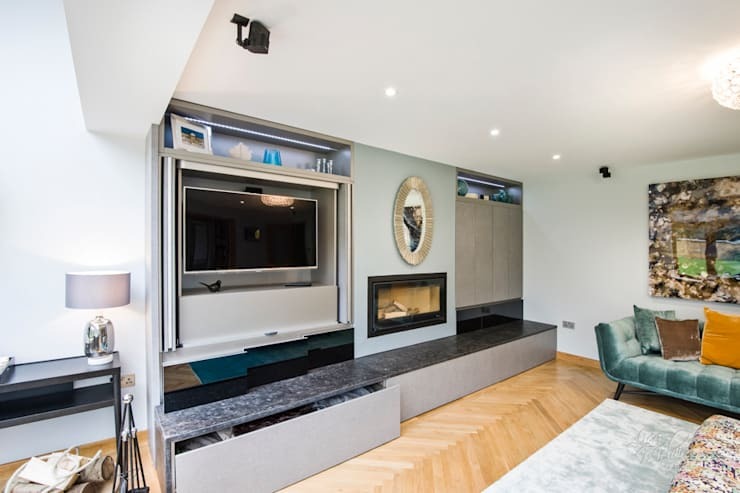 This new build from Simon Winstanley Architects is a brilliant example of how a television can be incorporated into a space without it imposing on the relaxing and serene ambience of the room. Here we see the standalone fireplace and cabinet which holds the TV effortlessly and easily. Furthermore this television-fireplace combination is converted from an awkward pair of home necessities into a feature for the space, and a wonderful area for the family to gather and socialise. The ultimate in hidden electronics, this design has taken the television and put it behind closable doors. TV’s can often ruin your keen aesthetic and well-designed décor. Ensure your room remains stylish by hiding your electronics in bespoke joinery. These days we are all trying to increase our physical activity and avoid becoming couch potatoes, by hiding the television we can ensure our living space does not revolve around electronics, but is instead a space for family, rest, and socialising. This is an excellent way to decorate around your television—this living space is replete with built in joinery, and a wonderful alcove especially for the large electronic necessity. Televisions are large and often very dark/black in colour, and this can affect your neutral colour scheme as they tend to stick out like a sore thumb. This design has made the most of that and used the TV to coordinate with the black fireplace space below. The two items look cohesive and well-designed with the predominately white colour scheme. 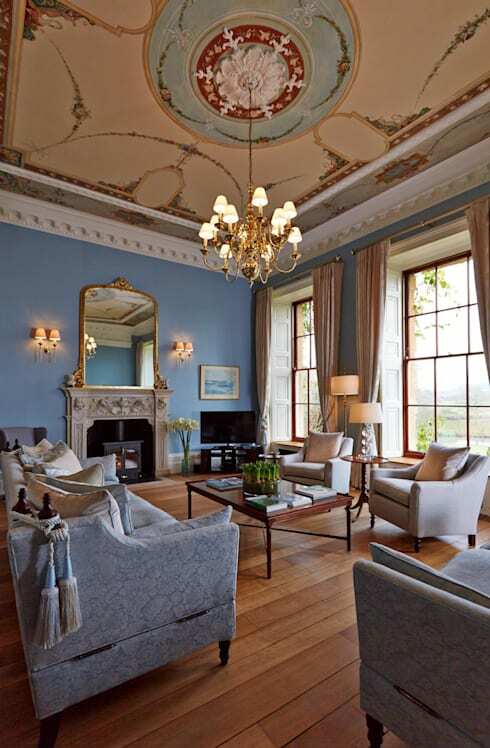 When you have a beautiful decorated heritage home, it can often be tricky to incorporate ultra-contemporary electronics. This room is a wonderful example of how it is possible. Recessive and unimposing in the corner of the room, the television is added as an accessory, rather than a central focal point to the space. The gorgeous Georgian furniture and decoration is simply stunning, and it would be a travesty to ruin that with a central TV. In order to keep the heritage and traditional aspect of the room, the television is placed in a space where it is still usable, but not trespassing on the serene living space.